Note: Today, I am posting a new pickle recipe. I was planning to refer the discussion I had made in this post, but when I got there the cupboard was bare, I found that I had forgotten to post the recipe. While this recipe produced a satisfactory pickle, the lemon flavor simply did not come through. I was looking for new Japanese cucumber pickle recipes and I discovered Just one Cookbook. If you are new to Japanese cooking, I highly recommend it as a good place to pick up the basics. Her recipes are simple and clear, although her videos go very quickly. You might have to watch them a few times, if the techniques are new to you. When I make pickles, I usually chop up the vegetables and then pickle them. Nami used a traditional Japanese technique of pickling the cucumber whole and cutting it up just before serving. I did not have any Japanese mustard, so I decided to use lemon peel for my pickles. What is clear is that some cucumbers have some bitterness, caused by the compound cucurbitacin. The article linked to gives some possible explanations for this. One explanation is that dry weather conditions tend to produce more cucurbitacin. “I” am growing “my” cucumbers to spread “my” seeds. When they are ripe, some animals will eat “my” cucumbers and spread the seeds “au natural.” If the weather is hot, the animals will be thirsty and eat “my” cucumbers before the seeds are ready. If the animals eat around the stem, I will lose that cucumber, even if the animal does not eat the whole fruit. If I make the stem taste bad, I will save at least half my cucumber, even if I have to sacrifice the bottom. Half a ripe cucumber will still spread my seeds. After Dinner Note: I tried both the rubbing technique (described above) on one cucumber and simply removing a half inch of the stem end on another. I was not able to tell any difference in bitterness, even when I tasted the slice nearest the stem. It is not really necessary to remove a half an inch from the flower end of the cucumber, because it does not contain the bitter compound. 1. Rinse and dry cucumbers well. Remove the stem half inch from each and about an eighth of an inch from the other end. 2. Take a lemon and take four or five half inch slices from the peel. Tip: Turn the sliced over and shave off any of the white pith that is still attached. 3. Stack the sliced and cut them into the smallest shreds that you can. Note: You should have about a teaspoon of half inch mini-matchsticks. 4. Put the lemon peel, sugar, salt, and mustard into the gallon bag and mix them well. 5. Add the cucumbers, press most of the air out, and seal the bag. 5. Rub the lemon peel sugar mix over the cucumbers. 7. Refrigerate for at least two hours. 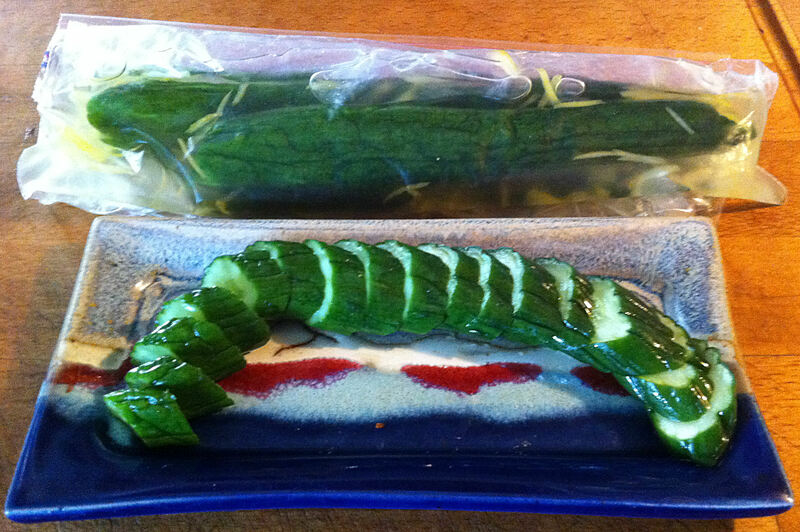 Tip: About every half hour, flip the bag so that the sauce is spread evenly around the cucumbers. 8. Remove, slice the cucumbers and serve. Tip: The pickles will be edible in two hours, but better by hour four and even better the next day.